Supercars are, by their very nature, impractical. They’re dramatic, fast, have doors that open in delightfully baffling ways, and if you take one to a hardware store all you’re coming home with is a fistful of drywall screws. But, once, long ago, Ford decided it didn’t have to be like that. 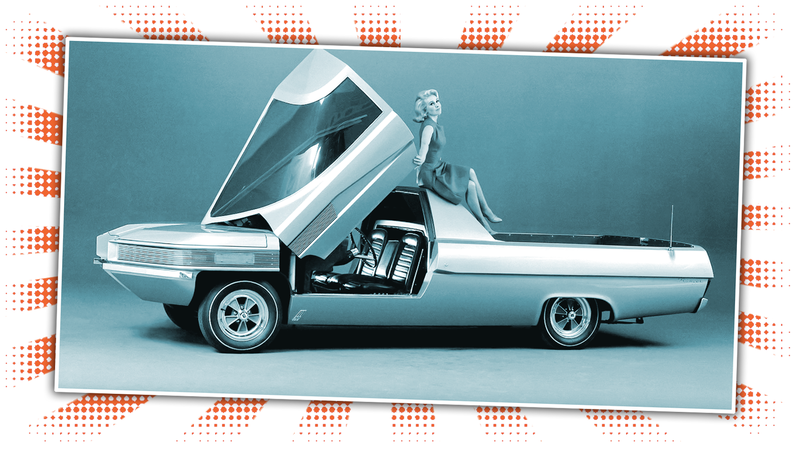 It was 1966 when, for a brief, glorious moment, Ford managed to bridge the chasm between practicality and raw supercarhood with a concept car called the Ranger II. To achieve this impossible task, Ford needed to bring out the big guns, and they did, hiring noted futurist-artist Syd Mead to design the truck. The result is, I’ll say it, astounding. Look at this thing: it has all the presence and drama of a supercar, including a gleefully bonkers door system, but also has a huge, practical truck bed at the rear, a truck bed lined with walnut and aluminum. Ford Division’s Ranger II is an ultra-modern pickup truck with a custom designed passenger compartment. Seen as a two-seater vehicle in the above photo, the Ranger II converts into a four-passenger pickup (below) at the flick of a finger. The rear portion of the cab moves 18-inches into the bed of the truck while a roof section moves up into position and two additional bucket seats fall into place. The Ranger II’s ultra-streamlined windshield is made of specially tempered plastic-type glass. It also features high intensity headlights of rectangular design, extruded aluminum grille and walnut flooring in the cargo bed. It’s like all those ‘70s design cues that ended up just seeming overdone and frumpy, but in their original, un-distilled state. The pointed, divided prow, the dramatic vee of the windshield, those grille-hidden lights, it all just works in this context. I’m not sure what that center hole is in the front there, but I’m assuming it shot a beam of concentrated fantastic-particles that made anyone it struck pregnant with a baby that could play electric guitar and make metal sculpture. Yes, I mean anyone. It’s also worth mentioning that this concept car actually ran. It was built on a ‘63 Ford station wagon frame, and even the A/C is said to have worked. Since this magical time, I’m not sure another supercar truck has even really been attempted. If this is what you have to beat, I can understand why.